Look at that photo. That's not how iconic playoff game-winners are supposed to look. LeBron James adds a conference finals buzzer-beater to his resumé, as the Heat take a 1-0 series lead over Indiana, but it'll always come with a caveat: conference finals buzzer-beaters probably shouldn't come on uncontested layups. At the risk of eliding the first 52-plus hard-fought minutes, Game 1 came down to three factors. A baffling personnel decision from Frank Vogel. A clever, familiar play call from Erik Spoelstra. And poor Paul George, fighting ghosts and guessing wrong. Vogel put Roy Hibbert on the bench for the Heat's final two possessions of overtime. Roy Hibbert. The guy who did this just a few days ago. Inexcusable, indefensible, and even hypocritical—about an hour before tipoff, Vogel spoke to reporters and flatly said he doesn't believe in countering lineups. Yet there was Tyler Hansbrough, in for Hibbert, with 2.2 seconds left, Indiana up one. Vogel took a stab at an explanation afterwards. Hansbrough is quicker than Hibbert, he said. 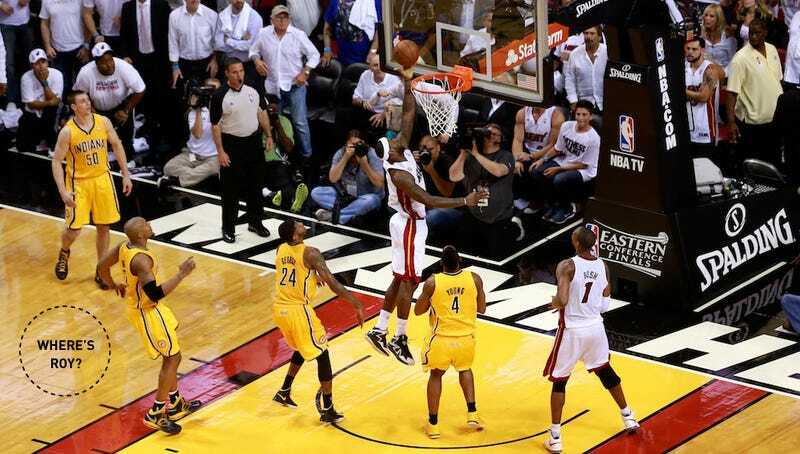 Hibbert would have been caught flat-footed if LeBron drove to the rim, then kicked it out to Chris Bosh for a jumper. Hansbrough could have stuck with Bosh. He's not wrong; there will always be second-guessing. But the odds and common sense both deny the equal validity of the two choices. You can look your team and the media in the eye and say we forced Chris Bosh to beat us, and he did. There's no shame in that. But even without the benefit of hindsight, inviting LeBron to drive the lane is a recipe for awkward postgame excuses. ESPN crunched some numbers, and found that LeBron played 38 minutes with Hibbert on the floor, and took just three shots from around the rim. But in LeBron's nine minutes without Hibbert in the game, he took six shots from the same proximity. "I think as I get older, I may have to [ask to stay in]," Hibbert said. "I didn't, and in hindsight I wish I did because LeBron's layup was one I think I could've [blocked], because he served it up." Of course, the play still had to play out. Paul George, an excellent defender, was matched up with James on the inbounds. But two recent possessions were in George's head, and they screwed him up before LeBron ever touched the ball. On the last play of regulation, Miami showed an almost identical look. James at the edge of the paint. Bosh at the top of the arc. Ray Allen cutting toward the far sideline, seeking a screen from Bosh. In that instance, Allen took the ball and heaved up a three. Seeing the same set, that's what George was expecting on the OT winner. George came up on LeBron, but hurriedly, and wasn't close to set when LeBron started rolling. At this point, George's muscle memory might've flashed back to the play just 10 seconds prior, when LeBron drove to his right, right at the help defender down low. An off-balance George cheated toward LeBron's right, maybe expecting him to go that way again. And again, the help was that way: Sam Young on the baseline, on Bosh. (Vogel's grand plan failed before it began. Hansbrough had switched on the pre-inbounds motion, and was now on Allen in the corner.) But LeBron went left, Hansbrough had his back to the ball, and now George was in the exact same position as every other Pacer, including Hibbert on the bench: nothing left to do but watch LeBron score.